EVG reader Kiki shares this photo and tip — the Liquiteria on Second Avenue and 11th Street is closing after service on Friday. 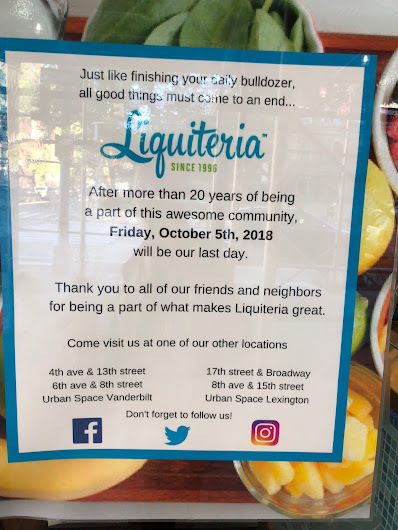 No reason was cited for the closure — just a thanks to Liquiteria's customers and neighbors. Doug Green started Liquiteria here in 1996, long before the juice/smoothie craze took hold. Green sold the business several years ago to a group of investors who then opened three more outposts. Those nearby locations at 13th Street and Fourth Avenue and Sixth Avenue at Eighth Street will remain in business. Had no idea this place was that old. I took it as a sign of gentrification and yuppie invasion of the high spending health conscious when they opened a location at 6th Ave and 8th St. replacing a long time hot dog place (Gray's Papaya?). But 20 years is a long time, not a fad business. I thought Liquiteria took over The Black Hound's space? Surely that wasn't 22 years ago? Before it was Liqueteria it was Lucky’s Juice joint, but they changed the name to make it sound more upscale and to justify their high pricing. Then Starbucks noticed and hired away their manager, because apparently there is some kind of big secret behind turning ordinary fruit and vegetables into high priced juice. Before that it was a 24 hour coffee shop where teachers, parents and kids from DCS, a/k/a Downtown Community School (which later became the Third Street Music School Settlement, now ironically located on 11th street) used to go for coffee, breakfast and donuts. The Black Hound was in a smaller adjacent store. I find it interesting that the same people who cheered for a higher minimum wage , paid family and sick leave always neglect to put 2+2 together when it comes to product prices. Combine those numbers with skyrocketing rents, city fees and fines, disproportionate commercial real estate taxes and credit card companies that charge you 5 pct for the privilege of helping them create a debt culture and guess what? Prices go up. It's unfair to criticize Liquiteria or any other business over what they decide to charge their guests unless you know their numbers. No one Ive ever met goes into this business thinking 'Boy, would I really get a kick out of opening up a small business so I can rip off my friends and neighbors.' I really think people need to start thinking before they criticize a small business. In the '70s and early '80s this was a 24-hour coffee shop that catered to the straight and drag hookers that used to work 11th Street between 2nd and 3rd Avenues. I can't remember what it was called but they had great burgers, and talk about the people-watching! Of course Liqueteria s charging higher prices to make more money, that’s why they changed their name from Luckys Juice Joint to a more upscale/ironic/corporate sounding brand name. And they have been known to use non-organic produce and lots of non-organic celery, which means the bulk of the liquid is not organic. And yet they still charge the same price for non-organic juice, which you could get anywhere else for half the price. The point is that New York is expensive for everybody, but if you sell a watered down product at twice the price expect to be criticized.